As you may have seen on Facebook or in our earlier post, we have two exciting events this weekend! You are cordially invited to attend: Nandina Loves Local (in Aiken), and Atlanta Does Derby Design. Both soirees are in conjunction with “LEE Loves Local,” a campaign by LEE Industries to support local businesses. In Aiken, we will be celebrating the talent of local artist Doug Larson. He will display a variety of paintings ranging from dramatic abstracts to striking landscapes. Doug is not only a friend of Nandina, but a favorite with our design clients. The Willcox food truck will be joining us with scrumptious American cuisine for lunch, free with any in-store purchase! Last but certainly not least, we will have a sampling of brews from Aiken Brewing Company. 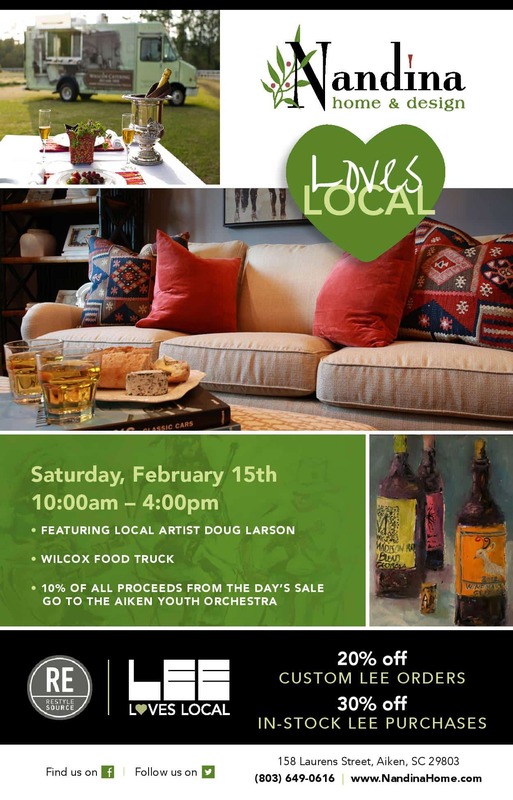 A portion of our proceeds will benefit the Aiken Youth Orchestra. In Atlanta, we will be featuring the artwork of Susan Easton Burns – the Kentucky Derby artist of the year! Of course, the Derby wouldn’t be complete without fabulous hats. Susan Morehead of Suzseams Millinery will be displaying her handmade designs, available for purchase just in time for the actual Derby in May. Parish Food & Goods is providing a delicious brunch with Kentucky Favorites, and we will be serving mint juleps! A portion of our proceeds from this event will benefit the Atlanta Beltline Partnership. For both events, we will be offering 20% custom LEE upholstery orders, and 30% off any in-stock LEE items. Whether you’ve had your eye on a piece in the store, or want to speak with our designers about your specific furniture needs, it’s a fabulous deal on North Carolina furniture. We can’t wait to spread the “local love” this weekend. See you Saturday!